1 colour Letterpress wedding invitation package consisting of letterpress printing 1 colour on our premium 600 gsm cotton Card with design artwork. 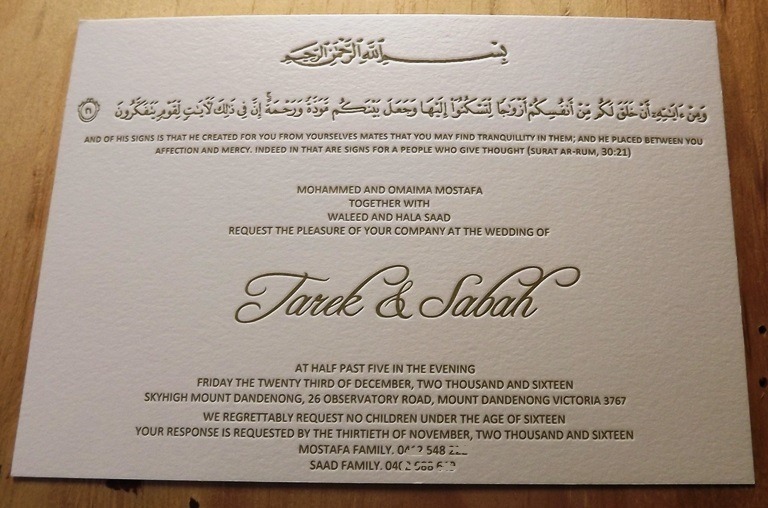 letterpress printing 1 colour invitation size 120mm x 190mm. letterpress printing 1 colour RSVP card postcard style size 120mm x 148mm. Invitation envelope on premium smooth white or cream to suit invitation package 250 gsm extra thick with guests names digitally printed on them. This package includes basic design typesetting printed in PMS colours of your choice. Autumn special with every order on this receives free place cards with black digital print on smooth white or smooth cream card.